The new black Kindle has been out for not even a couple of weeks and it has already been hacked for a new project. This weather station is the work of a hacker by the name of Matthew Petroff. He had always been wanting to use an E-ink screen in a project but until the $69 black Kindle was announced the cost was too high. Michael's project requires a jailbroken Kindle and a server. There's a fair amount of work inveigled, including writing scripts for the server which gather the data, make a screen shot, and pass it to the Kindle. More scripts on the Kindle listen for the new screenshot and then display it on screen. Michael notes that while he could have set up the Kindle to do the entire task, he already had the server and using it saved him the effort of setting up a development environment for the Kindle. Of course, if you don't want to put all this work into setting up this project you could get the Accuweather app for the Kindle. It's not nearly as good for this purpose but it does cost only a buck. And if you don't have a Kindle, you could actually be better off. 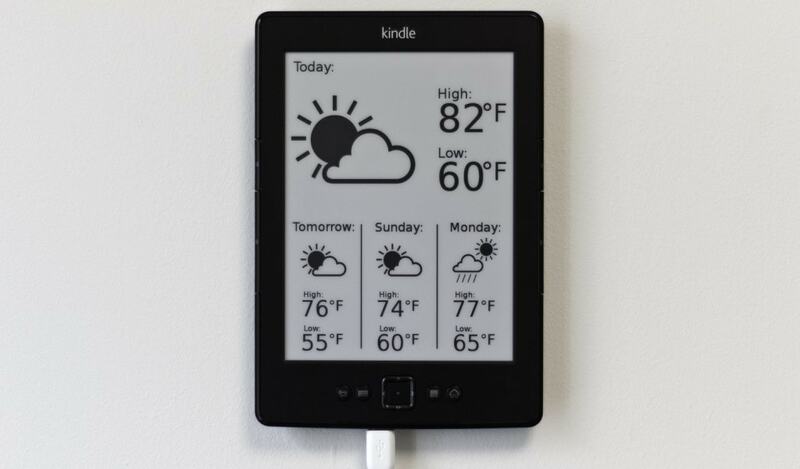 This idea could possibly be copied by running a weather app on a hacked Nook Touch. This ereader runs Android, and it should be able to use one of the many free weather station apps. In fact, I have a hacked Sony Reader T1 handy. And since I'm not using it as an ereader I think it would make a handy weather station. Unfortunately, I still have not found one that looks good on an E-ink screen. Any suggestions? >Of course, if you don’t want to put all this work into setting up this project you could get the Accuweather app for the Kindle. “Meet the Kindle: eReader, Audiobook Player, Weather Station?” raises an interesting question — how the $69 device it references can be an Audiobook Player without having audio capabilities. The Kindle Touch and K3 both have audio abilities and a variation of this hack will work on them. Good enough?